Pangasinan is a province of the Philippines. Its official language is Pangasinan or Pangasinense and its provincial capital is Lingayen. Pangasinan is located on the western area of the island of Luzon along the Lingayen Gulf and South China Sea. It has a total land area of 5,451.01 square kilometres (2,104.65 sq mi). According to the 2010 census, it has a population of 2,779,862 people. The official number of registered voters in Pangasinan is 1,651,814. Pangasinan is the name for the province, the people, and the primary language spoken in the province. Indigenous Pangasinan speakers are estimated to number at least 1.5 million. The Pangasinan language is one of the officially recognized regional languages in the Philippines. Pangasinan is spoken as a second-language by many of the ethnic minorities in Pangasinan. The minority ethnic groups in Pangasinan are the Bolinao, Tagalog and Ilocano. Pangasinan was founded by Austronesian-speakers who called themselves Anakbanwa by at least 2500 BC. 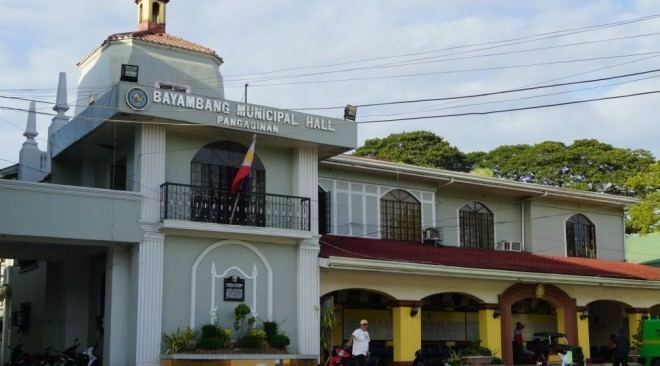 A kingdom called Luyag na Kaboloan, which expanded to incorporate much of northwestern Luzon, existed in Pangasinan before the Spanish conquest that began in the 16th century. The ancient Pangasinan people were skilled navigators and the maritime trade network that once flourished in ancient Southeast Asia connected Pangasinan with other peoples of Southeast Asia, India, China, and the Pacific. The ancient kingdom of Luyag na Kaboloan was in fact mentioned in Chinese and Indian records as being an important kingdom on ancient trade routes. Popular tourist attractions in Pangasinan include the Hundred Islands National Park and the white-sand beaches of Bolinao and Dasol. Dagupan City is known for its Bangus Festival ("Milkfish Festival"). Pangasinan is also known for its delicious mangoes and ceramic oven-baked Calasiao puto ("rice muffin"). Pangasinan occupies a strategic geo-political position in the central plain of Luzon, known as the rice granary of the Philippines. Pangasinan has been described as a gateway to northern Luzon and as the heartland of the Philippines. The Pangasinan people, like most of the people in the Malay Archipelago, are descended from the Austronesian-speakers who settled in Southeast Asia since prehistoric times. Comparative genetics, linguistics, and archaeological studies locate the origin of the Austronesian languages in Sundaland, which was populated as early as 50,000 years ago by modern humans. The Pangasinan language is one of many languages that belongs to the Malayo-Polynesian languages branch of the Austronesian languages family. Pangasinan is located on the west central area of the island of Luzon in the Philippines. It is bordered by La Union and Benguet to the north, Nueva Vizcaya and Nueva Ecija to the east, and Zambales and Tarlac to the south. To the west of Pangasinan is the South China Sea. The province also encloses the Lingayen Gulf. The province has a land area of 5,451.01 square kilometres (2,104.65 sq mi). It is 170 kilometers (105.633 mi) north of Manila, 50 kilometers (31.0685 mi.) south of Baguio City, 115 kilometers (71.4576 mi.) north of Subic International Airport and Seaport, and 80 kilometers (49.7096 mi.) north of Clark International Airport. At the coast of Alaminos, the Hundred islands have become a famous tourist spot. The terrain of the province is typically flat, with a few being mountainous. The northeastern municipalities of San Manuel, San Nicolas, Natividad, San Quintin and Umingan have hilly to mountainous areas, situated at the tip of the Cordillera mountains. 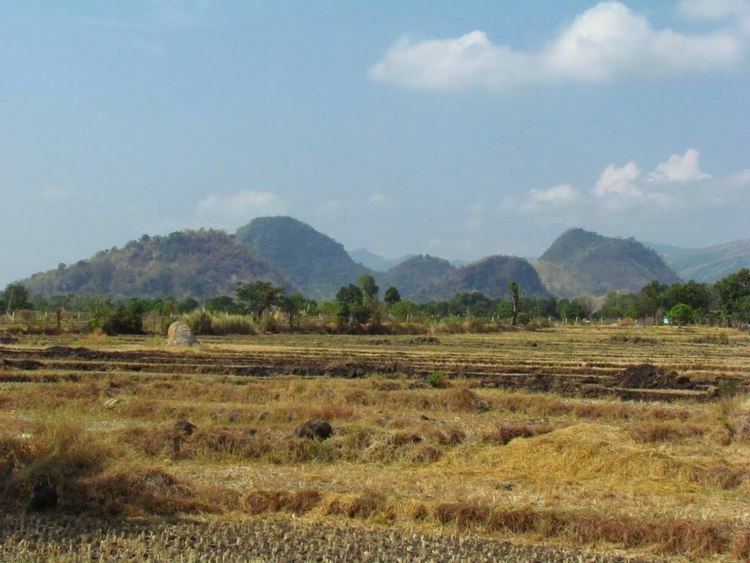 The Zambales mountains extend to the provinces western towns of Labrador, Mabini, Bugallon, Aguilar, Mangatarem, Dasol, and Infanta forming the mountainous portions of those towns. The Philippine Institute of Volcanology and Seismology (PHIVOLCS) reported several inactive volcanoes in the province: Amorong, Balungao, Cabaluyan, Cahelietan, Candong, and Malabobo. PHIVOLCS reported no active or potentially active volcanoes in Pangasinan. A caldera-like landform is located between the towns of Malasiqui and Villasis with a center at about 15° 55? N and 120° 30? E near the Cabaruan Hills. Several rivers traverse the province. The longest is the Agno River, which originates from the Cordillera mountains of Benguet, eventually emptying its waters into the Lingayen Gulf. Other major rivers include the Bued River, Angalacan River, Sinocalan River, Patalan River, and the Cayanga River. Pangasinan has export earnings of around $5.5 million. The culture of Pangasinan is a blend of the indigenous Malayo-Polynesian and western Hispanic and American cultures, with some Indian and Chinese influences. Today, Pangasinan is very much westernized. The main centers of Pangasinense culture are Lingayen, San Carlos City, Dagupan, and Manaoag.